By James Lara on Jun 25, 2013 - 24 Comments. Coming into The Last of Us, I knew that the main course would be served up in the single-player proportion. 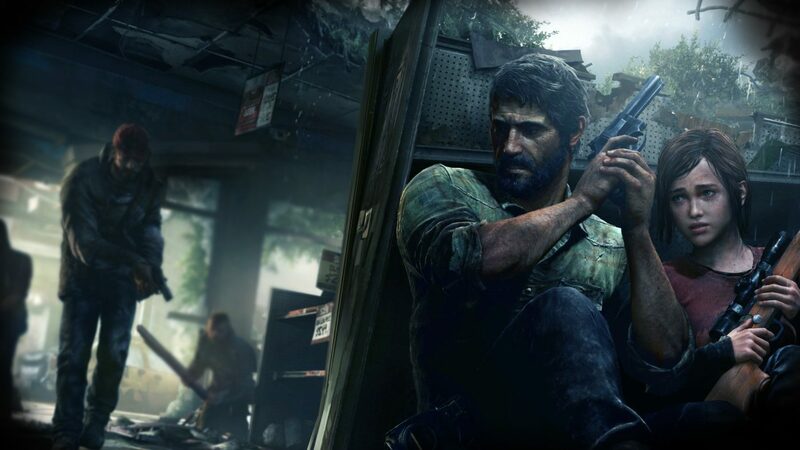 From the visuals, to the astonishing voice acting, The Last of Us offers one of the best single-player campaigns of this generation. And while Naughty Dog did keep the lid extremely tightly sealed on the multiplayer portion, saving its reveal for the last-minute made me even more excited for it. The multiplayer, though it does follow the same third-person play style, is very different from what we normally play today. By combining the core fundamentals of a multiplayer game with the same intense suspense that you get from the single-player, the multiplayer is surely one feat to be proud of. 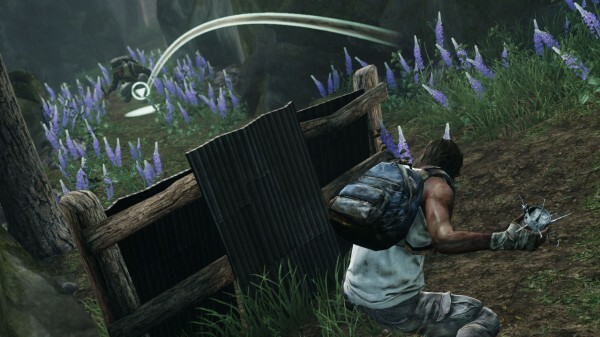 Naughty Dog is still somewhat new with the whole multiplayer genre. Their titles from Crash Bandicoot (PS1), all the way to Uncharted: Drakes Fortune have been nothing but single-player experiences. Their first title with multiplayer was Uncharted 2 and that went extremely well, with Uncharted 3 having made improvements in some areas (and dumbing down others). Now, the fear that many players have for TLOU MP is that it would end up being a carbon copy of Uncharted. I’m here to tell you that that isn’t the case and it isn’t close to it. While it’s presented in the same traditional third-person shooter view, what makes this game so much more different to Uncharted is pacing. Yes, we can run and such, but everything feels sluggish, in a good way. Moving around, you always feel that there’s danger lurking around the corner, and the likelyhood that someone is watching you is almost absolute. We can compare this title to SOCOM in terms of tactical gameplay, only it’s more limited. First and foremost, every single bullet you waste that isn’t a direct hit means life and death. You only get a few bullets per gun, making you more conservative about them. If you fire, you better have a clear shot, because if you don’t, your target has every opportunity to counter and all the enemies now know your current location. However, this unique, but deadly mechanic can also be used towards your advantage. More on that later. In most modern games today that feature a cover system, you have to push a button to initiate it. So, pressing circle would force the character to hug a wall. That button is no longer required and the cover system here feels, by far, like one of the most fluid systems yet. Everything in this game can be used as cover and this is due to the fact that anything that the character rubs against, they are automatically attached to it without any annoying snaps to it or camera shifts. If you were aiming to move across the map, this would play absolutely zero annoyances since it plays right into the movement. It’s easier to hide from enemies too, since the camera is set in a fixed range, meaning they won’t be able to peak over a box entirely to see if there’s anyone hiding there. This cover system supplies a huge amount of stealth, something that was lacking in Uncharted. As for vaulting and platforming, it nearly doesn’t exist. Sure we can vault over cover, but it’s slow, considering the gear you have, and is nowhere close to what Uncharted offers. You won’t be jumping down from high buildings, zip lining, running across rooftops, or scaling over walls. It’s all about keeping the pace slow and using stealth to counter opposing forces and if you play this like Uncharted than expect to be bad at it. However, the only downside to this is that we can’t stealth kill unless we craft a shiv, which brings us to crafting feature. 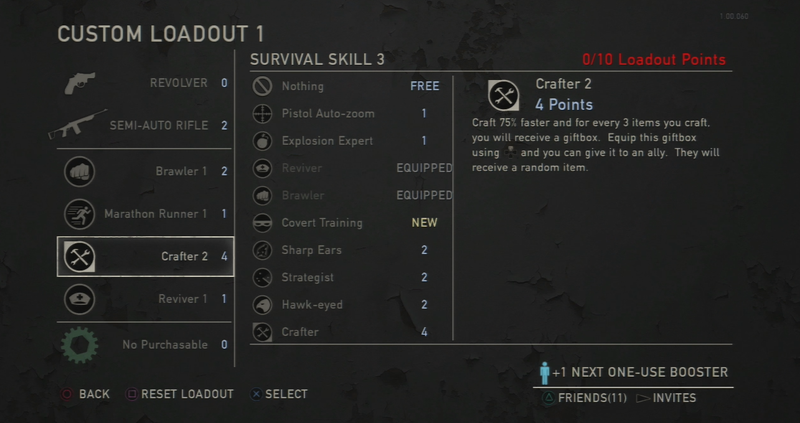 Crafting plays a significant role in the multiplayer, and in comparison, maybe even more than it does in the single-player. In total, there are six items that can be crafted, which are: Melee Upgrade, Shiv, Health Kit, Molotov, Bomb, and Smoke Bomb. When it comes to using a melee weapon, such as a piece of plywood or even a machete, they all have durability and will break after a certain amount of hits. By crafting an upgrade for it, the normal amount of hits it takes to kill an enemy with a melee weapon is greatly reduced. One hit from an upgraded melee weapon, and it’s an automatic brutal kill. This is the only way to do stealth kills, which really doesn’t make sense to me considering that we could strangle enemies in the single-player with the shiv being the only tool to kill clickers in stealth. This does come with its annoyances, considering that I have been in multiple situations where I could have used one, but the field has more than enough supplies to craft a few, along with a skill that will actually supply you with one. As mentioned earlier, firing can be used to your advantage since you’ll show up on everyone’s radar. Bombs can be used to kill an enemy, as the same with Molotovs. But to really get some true enjoyment, setting up traps is always fun to do, especially when they work. Watch as I demonstrate how giving away your position could work to your advantage. These have two uses; the first is to stun an enemy momentarily. This could either give you the chance to run (if there’s a hoard and you’re alone) or give you the opportunity to take them down. The second use is to supply additional cover. It’s nearly impossible to see what’s ahead of you when there’s a massive cloud of smoke and using smoke bombs to distract and move from place to place is the perfect way of utilizing them. The lack of multiplayer mode is probably my biggest con. At the launch, I was expecting it to have some standard modes (FFA, TDM, and CTF), along with unique ones, however that wasn’t the case. 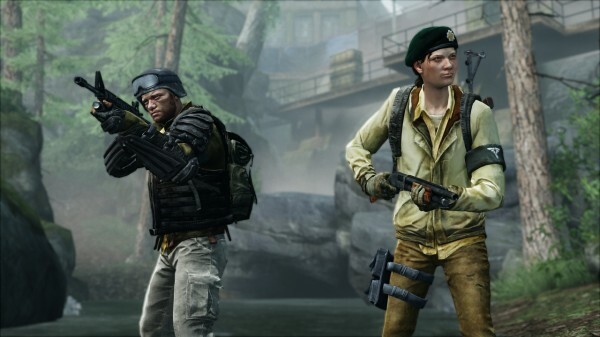 In total, the game features a mere two game modes which are: Supply Raid and Survivor. Despite it just being two modes, one of them pretty much just renamed, I can’t say I’m disappointed since the core game mechanics and the way the modes are set up are pretty damn enjoyable. It’s pretty much just Team Deathmatch with limited respawns. Each team has a respawn limit of 20 and if either team reaches zero, they’ll go into a last-man-standing round where they only have that one life left. This mode is also great for collecting the most parts (explained later). You only get one life, and teamwork is far more crucial here than Supply Raid. In total, there are seven rounds that can be played, unless of course one team has a higher win streak where the other team can’t catch up. 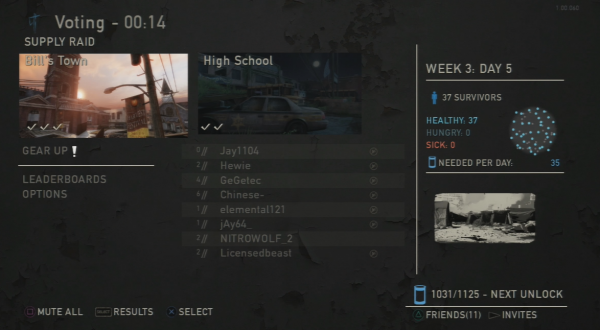 Both these game modes are available on all seven maps. The great thing about the maps is that they are from the single-player, though with a few change-ups to make them support 8 players. I can’t say any of the maps in TLOU are terrible, or that there is even a single one that I hate, as I found all the maps to be well crafted in terms of design and graphical looks. The nice thing is that all the maps have different themes, too. On one map, you’ll be fighting your way through blankets of snow, while in another, you’ll be walking slowly and quietly due to its close quarters feel. That’s the nice thing about these maps; they have both close quarters and open areas that allow for intense firefights. Everything is designed for stealth, and it’s all great to look at. Seeing a waterfall’s mist roll in to cloud the battlefield on a green flourish dam, it’s so eye appeasing to see in game with such a grim setting. Don’t expect it to look muddy with fifty shades of brown. The Multiplayer does feature a leveling up system, though it’s not your traditional one. When a player starts their multiplayer campaign they must, select from two factions; The Firefly or The Hunters. This is where things get a little interesting. The number rank you see on a player represents how many weeks they have survived. Every match represents a day, with the 7th one being the last in the week. So, say you are on week 4, day 3. This would mean that your rank 3 with only 5 matches remaining until the next level. I’m not sure how high it goes, but I’ve seen people go to 14 weeks, even though 12 weeks seems to be where the unlockables stop unlocking. This all plays into a mini game where you collect parts in order for your clan to survive. From time to time, you’ll be given challenges such as down “x” number of enemies, revive “x” numbers of team mates, and much more. For every kill, an enemy drops supplies, and for every crafted item, you gain some money, which can be converted into supplies at the end of matches. My personal first thought’s were: “This is such a tacked on and useless feature.” However, upon advancing into a higher level (9-12), I began to be more careful in-game. I don’t know what happens when you lose all survivors, nor would I want to find out, but I am assuming that it means you die and would have to start all over again with selecting a faction from week 1. It also made me a better team-player, whereas I want to earn additional parts for healing teammates or spotting enemies. However, the system becomes broken at a certain point. Say you have somewhere between 120-150 survivors, that would mean you would need, every match, somewhere between 120-140 supplies, which is absolutely impossible without boosting. It’s not possible. Trust me. I’ve tested it and with the challenges that pop in and can wipe out 20% of the population, there is not enough to keep up with supplies. It needs to be toned down, and it saddens me to know that I may never get some unlockables due to this system unless it gets patched. This system is great, but has huge cons. As mentioned, there are unlockables in this game. These unlockables range from guns, survival skills, to even new apparel. 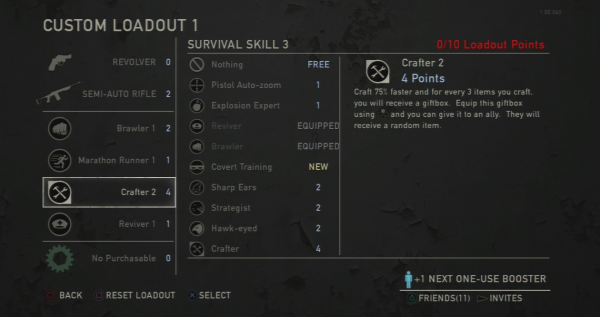 Survival Skills are pretty much your perks, and they do have higher level tiers for each skill. Despite the game making it seem like you can attach up to four high leveled skills, in reality, you can’t. Characters have load-out points (13 max) and each weapon, booster, and purchase slot take up an “x” amount of points. So that means we won’t be seeing any high level skills being partnered up with other high level ones. Guns can also be modded with silencers or upgraded ammo slots and such. It’s your ordinary weapon customization. The apparels are disappointing, due to the fact that we can only customize what we are wearing on our faces/head. You don’t even get to pick whether you are a male or female as everything after the hat, mask, and helmet selection is decided by the game. There’s no full character customization, which is a downer considering that I really wanted to make an awesome looking raider. The community though has to be the best I’ve ever seen in any game. We know that the PlayStation 3 had it’s fair issues with online gaming, where a mass amounts of gamers lacked mics. Though it’s been seven years, it’s still pretty common to find a whole lobby with no mics, but that’s okay because everyone knows what your saying already. If you stick in groups, use the radar, and tag, it’s very easy to get a smart team together that knows how to play. Naughty Dog has implemented so many ways to communicate without vocals in this game, it’s actually nice not having to always use a mic. The game is pretty active as it stands to0, with new players coming into the mix everyday. I’m not sure if this game will last for a long time, but it certainly will always have a community to support it until the next one comes out. Overall, it doesn’t exactly live up to the “best ever conceived” multiplayer game, but it’s far from disappointing. The multiplayer has captured the idea that you truly are being hunted and must do everything in your power to survive. It’s live or die, hunt or be hunted, a true battle of the fittest.